I've been under the weather a bit this week, and combined with Paul being away earlier in the week, I haven't had much of a chance to post. I made this card on the weekend using Baza Breeze and Riding Hood Red, two of the new InColours which start selling next week. I am already loving the new InColours and can't wait to get my hands on the gorgeous new ribbons. The stamp set is the level 2 hostess set Echoes of Kindness. This is exclusive to hostesses, so you'll want to book a workshop to get your hands on this one! Be back soon. Under instructions to take the rest of the week very easy. Thank goodness for my school Mum friends helping out with the boys. The new 2009 Stampin' Up! InColours - how to they compare and contrast with our existing colours? I got busy with my circle punch, scanner and Photoshop on the weekend to make up these colour charts to show you how the new colours compare to our existing colours. Hope you like them! Not long now and you will have them in your hot little hands! Some more peeks and THANKYOU for the rain! I am delighted to say it is absolutely BUCKETING down outside at the moment in the Yarra Valley. I know that can never help those that lost lives and houses on Black Saturday, but I hope it goes a long way to giving the emergency crews some hard earned rest, easing the anxieties of those still concerned about fires around them and to start regenerating growth in some of the forests. 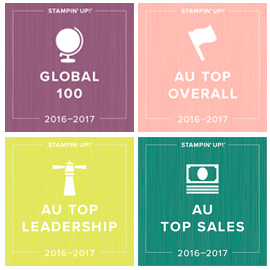 I'm also delighted to say Stampin' Up! has been raising lots and lots of money for the bushfire appeal. On the 5th March, the total was up to an amazing $58 000+ and there was still 25 days of the promotion to go. Thankyou to all who has supported this cause. As promised here are a couple more sneak peeks for you of what's coming soon. This is one of the level 2 hostess sets and you could earn it for free (plus get a free catalogue and $70 free merchandise from the new catalogue) by having me out to run a free home demonstration of the new products, and sales from your party totalling $600. I can help you plan a great party to make that a reality - just call me on 9735 2946 and we can chat. Here's another Fresh Cuts card, this time I have watercoloured.with the stamp pads in Kiwi Kiss and Tangerine Tango. 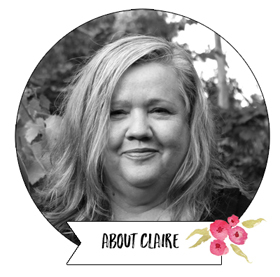 Remember if you want to be one of the first to get your catalogue, you need to earn your free one (with a $100 order, booking a workshop for April or May or joining a stamp club for a Wednesday during the day or Monday night or by mail) or preorder by the 18th March. Just email me to ask more information about any of those. I'm home this weekend to take orders and calls too. As promised here's a quick card using a couple of the new In Colours coming on 1st April. I know you are going to LOVE these new colours. This card uses Pink Pirouette and Baja Breeze, together with an old favourite Chocolate Chip. It also uses a new stamp set Fresh Cuts, which come with matching die cut cards (not shown here). There's extra samples coming this weekend for my customers and my newsletter subscribers, as well as a giveaway of a couple of gift baskets I have made up with some products (one for my customers and one for my newsletter subscribers). There's still time to get yourself on the list. Just place an order this weekend by emailing me or calling me on 97352946 to go onto my customer list and enjoy my customer only benefits over the coming year. If you just want to join my subscriber list, the signup box is top right. (Other demonstrators and international stampers are welcome to join my newsletter list, but the gift basket can only be given to a resident of Australia who isn't a demonstrator). Just had to play along with this weeks Kristina Colour Challenge 44. Love these colours together. As soon as I saw the challenge, I knew I wanted to use a decorative trim of some sort to tie in with the textile theme of the picture. This is some old Making Memories trim I had lurking in my trim stash. I just love ribbons and trims. This trim added some nice texture to the card and toned in well with the Pink Pirouette - bonus! The greeting is from the Stampin' Up! Cherished Memories rub ons.